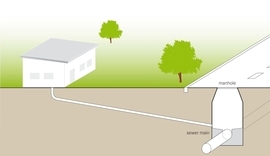 A septic tank system that uses gravity to make the wastewater flowing out of the tank run downhill through pipes to the drain field or collection network. Factors such as how level the ground is, the quality of the soil, and where the house is located will affect the cost of a gravity system. The project can range between $4,000 and $25,000.